Public surveillance has proven to be of great value for a host of public-order interests, from traffic management in large cities to provision of vital intelligence and evidence in criminal activities. The extent of surveillance in a jurisdiction tends to reflect the values of the government overseeing its use. We have been using this technology for some time. Many readers will recall the chilling images of bombers entering the London subway on 7 July 2005, of James Bulger’s killers leading the toddler away in 1993, or rogue former police officers Roger Rogerson and Glenn McNamara captured on CCTV dragging the lifeless body of Jamie Gao, who they had just murdered, in a surfboard bag out of a Sydney storage unit in 2014. In these cases, and countless others, the use of surveillance footage in the collection of criminal intelligence provided a rich source of investigative leads. Similarly, using drones and automatic number plate recognition for surveillance of criminals are technically efficient and cost-effective techniques. And members of the public have ready-access to dashboard cameras and camera phones able to capture evidence of criminal conduct as well as expose the unlawful conduct of government authorities. Discussions of surveillance almost always return to the ‘Big Brother’ concept from classic dystopian novels such as Aldous Huxley’s Brave New World (1932) and George Orwell’s 1984 (1949). More recently, the same themes appeared in Cory Doctorow’s Homeland novels which portray the overzealous use of invasive surveillance technology. Literature has played a big role in highlighting the dangers of the incremental surrender of civil liberties in the name of security. Opponents of the expansion of surveillance argue that it is less helpful than its prevalence suggests, even in cities with saturation coverage, such as London. Britain has more than 4 million CCTV cameras, and the average Londoner is photographed nearly 300 times a day. However, a report by London police showed that only one crime was solved per 1000 cameras. China uses surveillance technology to address crime and public order issues, as well as to censor political debate. The New York Times recently reported on how the government has inundated China’s public spaces with CCTV cameras. The Times reporter also spoke to police testing mobile facial recognition technology embedded in eye glasses. In this instance, the technology’s use was relatively benign, being trialled at a railway station, to the distaste of some passengers. But its use against dissidents or the restive population of China’s Xinjiang province is likely to be more aggressive. Facial recognition technology could be used to “pick and pluck” a terrorist out of a large crowd. But Chinese authorities are also using it for more mundane social order issues, including naming and shaming jaywalkers on large street-level screens. Last week, Chinese authorities provided another example of physical backup to the technological leviathan they have in place, in the wake of an explosion outside the US Embassy in Beijing. In customarily efficient fashion, social media mentions of words relating to the incident were rapidly censored, and at least one citizen who had spoken to foreign media was quickly apprehended by plain-clothes agents who told onlookers that they were family members. Australia drew upon similar technology at this year’s Commonwealth Games, using images obtained from drivers licenses in conjunction with facial recognition technology. 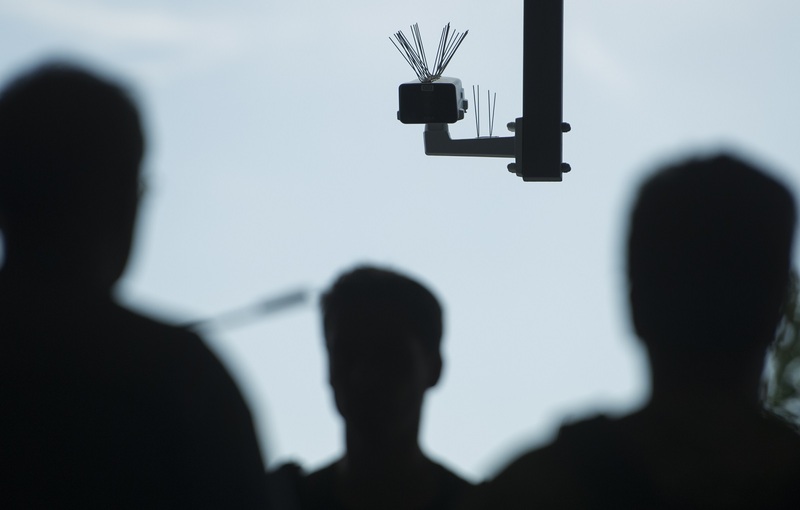 Other states and businesses are investigating facial recognition technology for a number of purposes, from policing unruly sporting crowds to its use as a ticketing system. Yuntech, a joint venture between Ticketek and Chinese electronics company Yongle, is already developing capabilities for its use in Australia. Much has been said about the national security implications of Chinese technology companies operating in Australia. But Australians are also concerned about our domestic technological privacy following lamentable failures to protect our confidential records. The Electoral Commission meltdown in 2016, secret documents being sold in a cabinet by a second-hand furniture dealer, Edward Snowden’s revelations on domestic spying by the US, the Cambridge Analytica scandal, the plethora of WikiLeaks revelations, ongoing concerns about the privacy of the My Health Record scheme, and the sight of drones hovering above our homes have accelerated the debate about privacy. Clearly we must strike a balance: we should use technology where it presents clear benefits to the public good, but the public should be well informed and has a right to be wary of government guarantees on privacy. We have been asked give it up with only glib assurances on data security. The Privacy Commissioner, civil liberties groups, and the media are right to question the increasingly arbitrary use of surveillance technology, and to seek clear justification for its public good. It is a truism that human rights once lost are hard to regain. Australia has no need to become a surveillance state like China, the Russian Federation, or, for that matter, Britain.